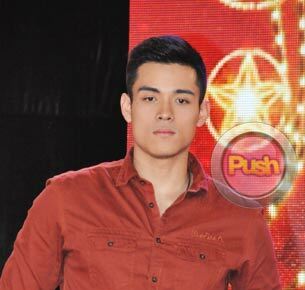 Xian Lim stands by Kim Chiu amidst intrigues involving her, Maja Salvador, and Gerald Anderson. “I will give her an open ear and a lending hand. I will just be there for her,” said Xian Lim who stood by rumored girlfriend Kim Chiu when the actress bravely faced the local media as her name got dragged into the Maja Salvador-Gerald Anderson controversy. Xian did not leave Kim’s side as soon as they entered the Luxent Hotel ballroom where the Ina Kapatid Anak press con was held last Tuesday night. Throughout the program, Xian probably distracted her from the tension of being in the same room with Maja by making Kim smile and whispering to her every now and then. He also stood beside Kim when she was finally asked to clarify the speculations about her falling out with Maja. As it is, he’s good friends with Maja as well and the three of them would often hang out together with Ina Kapatid Anak co-star Enchong Dee even outside work. But there was no time to get Xian’s reaction about Kim and Maja’s situation as they were immediately ushered out of the ballroom after the program. On a different note, Xian happily shared that he got the chance to celebrate the holiday break with Kim. This time, he followed her to Subic where she was vacationing with her family. “Nung Christmas Day they were in Hong Kong. After Christmas, nakakatuwa… I surprised her. Kami naman wala kaming pupuntahan sa New Year. Masaya na nakasama ko si Kim nung bagong taon. Masaya. Sana ii-invite pa niya ako sa mga susunod na party. I’m happy to be with her,” he beamed.